The perfect take-along companion for your good time needs! With 300 sq. in. of porcelain coated cooking surface, you’ll be the envy of the camp ground, RV site, stadium parking lot or picnic area. Take your oven with you!The Tailgater is not limited to succulent burgers, juicy smoked venison or tantalizing grilled trout; you can also enjoy its wide gamut of baking features. Finish off that hearty burger with some warm, chewy chocolate chip cookies right off the grill!Your entire meal is prepared using one easily portable appliance. 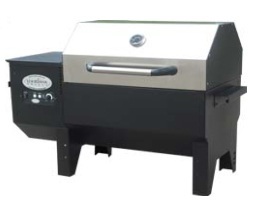 All our Country Smoker series grills are painted with matte finish barbecue paint, ensuring durability and easy maintenance. Our Tailgater takes up minimal space, making it the winning take-along appliance for your portable party! The Tailgater is a guaranteed crowd pleaser for your group.